I read this article and found it very interesting, thought it might be something for you. 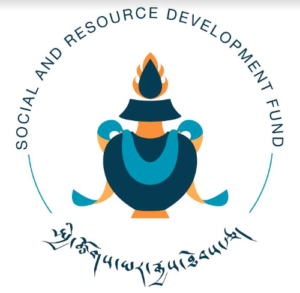 The article is called Need to end China’s long game on Human Rights: Geneva Human Rights Forum and is located at https://tibet.net/2018/11/need-to-end-chinas-long-game-on-human-rights-geneva-human-rights-forum/. 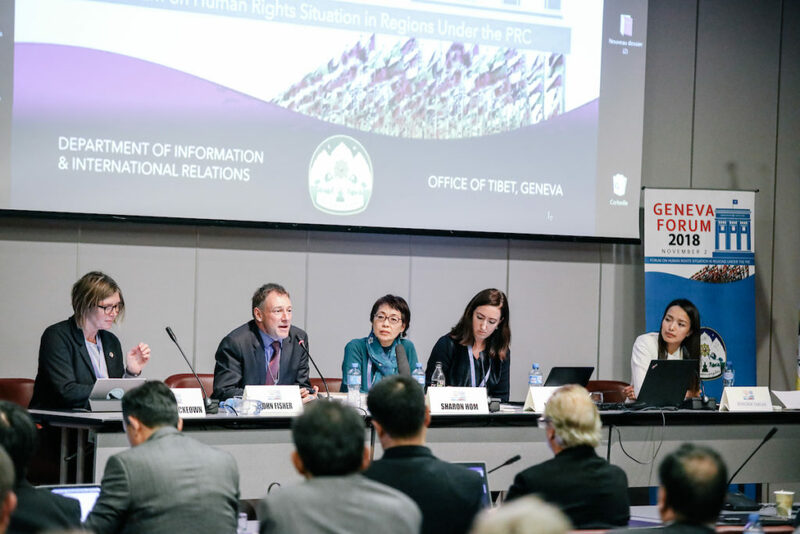 Geneva: Four days ahead of China’s third Universal Periodic Review (UPR), a day-long forum titled “Forum on Human Rights Situation in Regions under the PRC,” jointly organized by Department of Information and International Relations (DIIR), CTA and Office of Tibet, Geneva took place in Geneva. 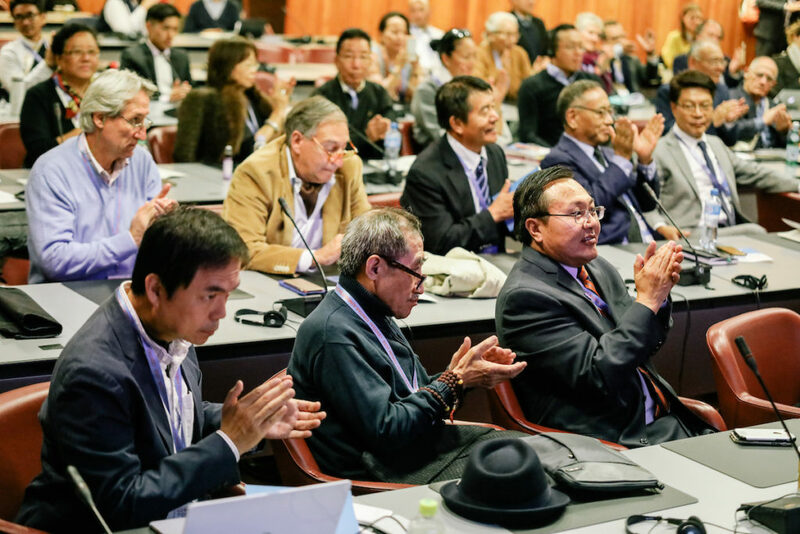 The Forum brought together a select group of human rights experts, academicians, diplomats, practitioners, advocates and activists at Centre International de Conférences Genève. The UPR is a UN Human Rights Council mechanism to enable States to make comprehensive evaluations of the human rights situation in all UN States. The UPR is an important tool for civil society organizations and governments to use in engaging with China on current human rights situations. China’s third UPR is scheduled to take place on November 6. Human Rights Situation within the PRC under the CCP rule. 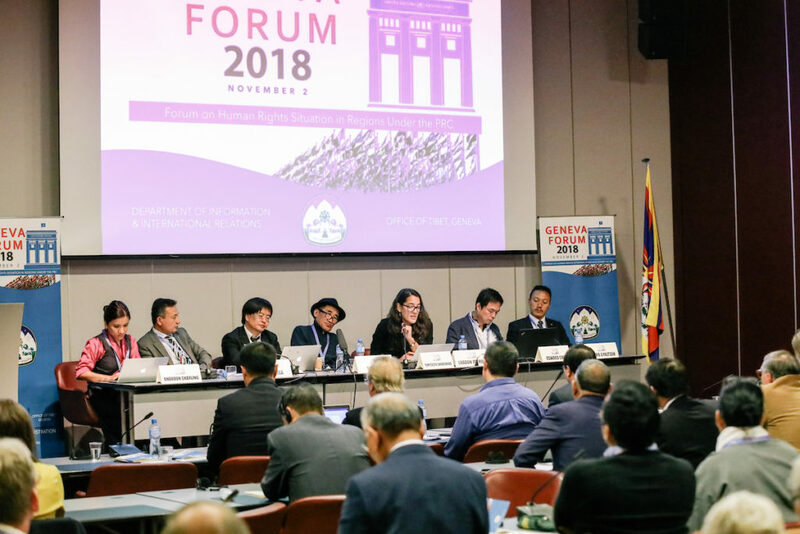 The first panel at the “Geneva Forum,” moderated by Kai Mueller, Head of UN Advocacy for the International Campaign for Tibet, discussed general trends of rights-related developments in the People’s Republic of China. Min Lee Mitchell, RFA managing director for East Asia, spoke about the downward trend under Xi Jinping’s rule in recent years. Uyghur and Chinese democracy activist Wu’er Kaixi criticized the Western governments, particularly the US government, for their “naiveté” towards China, as Western governments had not understood the motivation and intentions of the Chinese leadership. 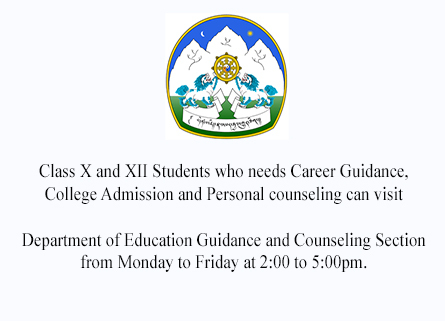 Thupten Samphel, Director of the Tibet Policy Institute, laid out the significance of religious policies for Tibetans with particular view on the appointment of Tibetan religious leaders, such as the Dalai Lama. He criticized the Vatican’s recent agreement with the Communist Party on the appointment of Catholic bishops in the PRC and expressed concern about the concept of “sinicizing religion”, which would have a lasting and extremely negative effect on Tibetan culture and Buddhist religion. Professor Dru Gladney of Pomona College gave an overview of the effects of the BRI on Uyghurs. While arguing that Chinese policies themselves have led to a “Xinjiang problem”, he expected the BRI, being “globalization with Chinese characteristics”, to cause more pressure on Uyghurs. Engebathu Togochog, director of the Southern Mongolia Information Centre, gave an overview of the history of assimilation policies in Southern Mongolia. Among a number of policies, the stigmatisation of herders and nomads in Southern Mongolia and the ban on grazing had led to an uprooting of an entire culture. The panel discussed Chinese strategies to create powerful narratives which aim to dominate the discourse on critical policies adopted by the Chinese government. Concerned governments should push back on those narratives. One way to achieve this was to challenge Chinese terminology and to demand access, for example to Xinjiang and Tibet, for diplomats or journalists. The world had slowly woken up and become more alert. With a view on Xi Jinping’s rise to power and the extension of his leadership per constitutional amendment, it was not at all clear whether he would be able to hold on to power, given the scale of his signature projects, such as the BRI. At the same time, Chinese citizens react in an ambivalent way to the increasingly repressive policies in China, which would affect daily lives of ordinary Chinese. Many would welcome the “Social Credit System” as a means of rewarding “good behaviour”. 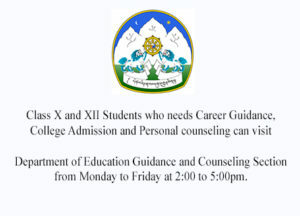 However, the repressive policies applied by the government would indicate a lack of trust and a feeling of insecurity of the Chinese leadership vis a vis its own people, Tibetans and Uyghurs. 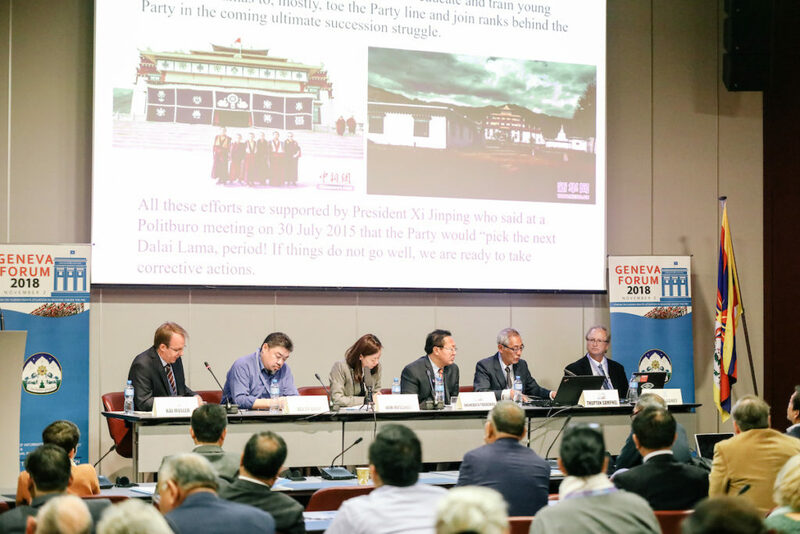 The second panel at the “Geneva Forum” discussed the Situation in Tibet, East Turkestan, Southern Mongolia and the case of Hong Kong. DIIR’s Information Secretary Dhardon Sharling moderated the session. The first speaker Dr. Shao Jiang, Tiananmen massacre survivor, activist and independent scholar based in the UK spoke about the overall developments in PRC and why and how China is muscling its way on to the global human rights stage. Dr. Shao lamented the fact that it is no secret that rights violations or abuses are rampant and have only exacerbated over the years, but what is worrying is the fact that since the ascension of President Xi Jinping in 2013, China is moving beyond playing defense and adopting a more self-confident posture in the halls of the United Nations. 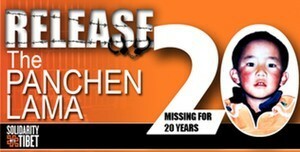 Dr. Shao called for concerted efforts to hold China to account for its rights violations in China. 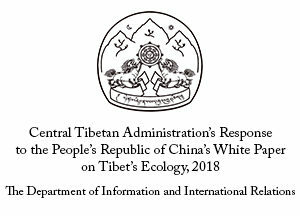 Tempa Gyaltsen, Research Fellow focusing on environmental situation inside Tibet at the Tibet Policy Institute of CTA, gave a presentation on the socio-environmental rights of the Tibetan people. 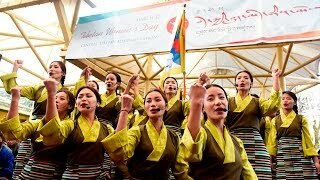 The presentation reiterated the understanding of Tibet as the roof of the world, Earth’s Third Pole, Asia’s water tower, Asia’s rainmaker and as both a driver and amplifier of global warming. Tempa Gyaltsen pressed the case of forced eviction of over a million Tibetan nomads being carried out by the Chinese authorities and brought to the table the then Special Rapporteur for Food, Oliver D Schutter’s communication with Chinese government warning of severe consequences and saying that Tibetan and Mongolian nomads should not be compelled to shun their way of life to forcibly resettle. Speaking about the 2016 protest against mining on sacred mountain Gong-yong-lhari in Amchok, Tempa highlighted the case of three Tibetan self-immolations that took place at mining sites. 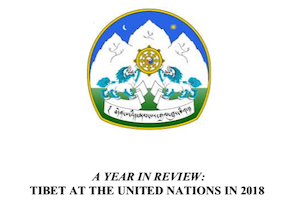 It is noteworthy that the UN Special Procedures and Mandate Holders questioned the crackdown on peaceful protestors at Amchok in “joint urgent communication they made to China in February 2017.” The discussion raised the fact that two critical issues that face Tibet is Tibet’s political future and Tibet’s environmental future. Of the two, the latter is a bigger issue given the implications for Asia and the rest of the world. Temseltu Shobchuud, spoke about the situation in Southern Mongolia and the rights of Mongolians. In his impassioned speech, the partisan leader of 1981 Southern Mongolia Student Movement and Chair of Southern Mongolian Congress spoke about how apart from the rigorous and rampant racial discrimination, Southern Mongolia has become China’s model for assimilation and that the mode is used to further China’s assimilationist agenda that is being replicated in Tibet and East Turkestan as well. “Action is what is needed and is the reason for us to be here at this critical moment in our history,” said Temseltu. “The case of Hong Kong which could be the next Tibet is a glaring example of China’s commitment or lack therefore to upholding its promises and agreements,” said Edward Chin, Convener of Hong Kong Monitor- 2047. The discussion that followed stressed on the fact that, the encroachment on Hong Kong’s freedom also raised a stark question for a Chinese government with increasing ambitions on the world stage. Speaking about why Tibet holds the key to holding China accountable, Lhadon Tethong, activist leader, human rights advocate and director of Tibet Action Institute, said, “For China, Tibet is a laboratory for repression and for Tibetans, Tibet is a laboratory for resistance.” Lhadon added that despite the repression, Tibetan people are preserving their Tibetan-ness and critically continue to put China’s rule to test. 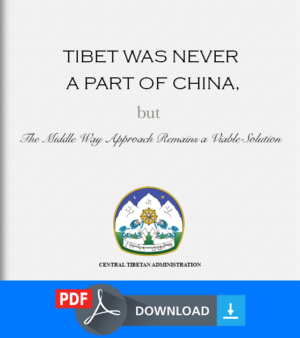 The session concurred that Tibet continues to be a cautionary case for the rest of the world but at the same time, Tibet presents an opportunity to holding China accountable. The third panel at the Geneva Forum addressed the challenges faced by China’s significant rise in power with particular reference to the UN forum, and how in recent years the Chinese government has played an increasingly assertive role in silencing criticisms of its own human rights record and craftily developed a distorted interpretation of universal human rights challenges, the integrity and credibility of the UN human rights system as a whole. 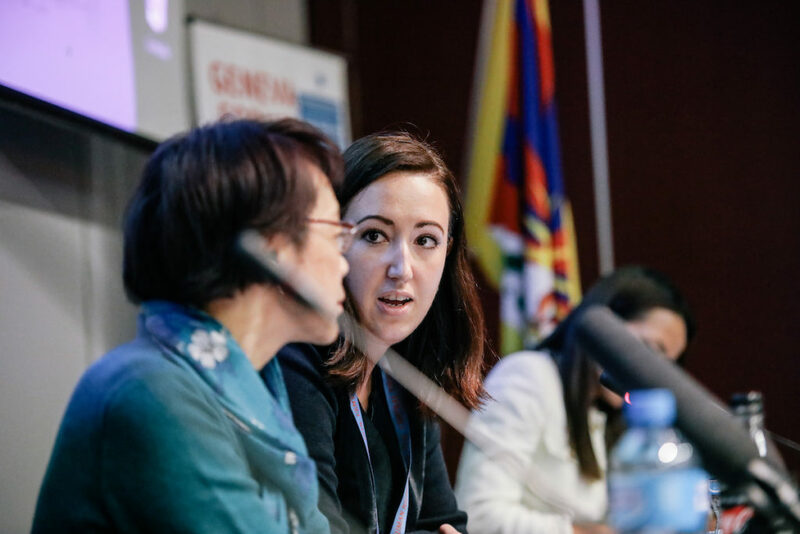 Mandie Mckeown, Campaigns Director, International Tibet Network moderated the session. Kunchok Dolma Yaklha, Associate UN Advocacy Officer, Office of Tibet, Geneva presented a historic information highlighting how Tibet was previously very well supported at the UN with evidence of a series of strong Tibet resolutions that were passed, and continued by raising the important question as to why this previously strong support has now waned, and why China was seemingly able to alter the human rights assessment tools of the UN bodies. Kunchok ended by raising a number of strong recommendations that if implemented could work to reverse this situation and would protect the integrity of the UN human rights system which is being threatened by China. Marin Ping from Freedom House discussed the trends that have been seen in China’s engagement in all three UN pillars, and in particular the ‘third pillar’ mechanisms for human rights. Marin proposed that the mainstreaming of human rights into pillars 1 and 2 would not mean ‘changing’ human rights discourse but would help to expand it and thus could assist civil society in raising the alarms about China’s (or other countries) human rights violations across the UN system. Sharon Hom, Executive Director of Human Rights in China, put forward key points about how the legal and political developments in China are now being embedded and exported by China into international strategies. Sharon raised the question about what the international community must do to counter this ‘weaponization of international rights’ by the Chinese government to push back and to end the stifling effect they are having on human rights defenders and civil society under the Chinese Communist Party rule. Given that the United Nations plays a crucial role in holding governments to their international human rights obligations and helping to protect human rights, central elements of this work include fact-finding and investigative visits by UN experts, deliberations in the Human Rights Council, and review of state compliance with human rights treaties. In recent decades we have watched the steep rise of China on the global stage while at the same time witnessed a steady decline in human rights in all areas under Chinese rule and a decline in the challenges China faces for these abuses. With substantive presentations, discussions, and powerful testimonial from Tibetan filmmaker and activist Golog Jigme, the Forum hoped to be a rallying point not only for the upcoming UPR but also for stronger advocacy at the UN and at international forums, and to deconstruct China’s weaponization of its constructed terms and concepts in the Chinese narrative terms. 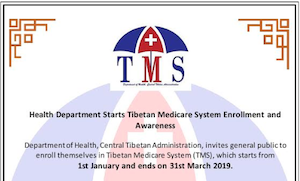 Report filed by Panel Moderators: Dhardon Sharling, Secretary, DIIR, with inputs from Kai Muller, Head of UN Advocacy for the International Campaign for Tibet and Mandie Mckeown, International Tibet Network.